Normally the consecrated host is kept in a tabernacle. During Eucharist Adoration it is placed on the altar in a monstrance to be venerated; to be kept company by the faithful for visitation, contemplative prayer and meditation. Adoration is a sacred time to keep Vigil with the Lord; to spend quiet time with Him. Perpetual Adoration is offered at Holy Cross Catholic Church. 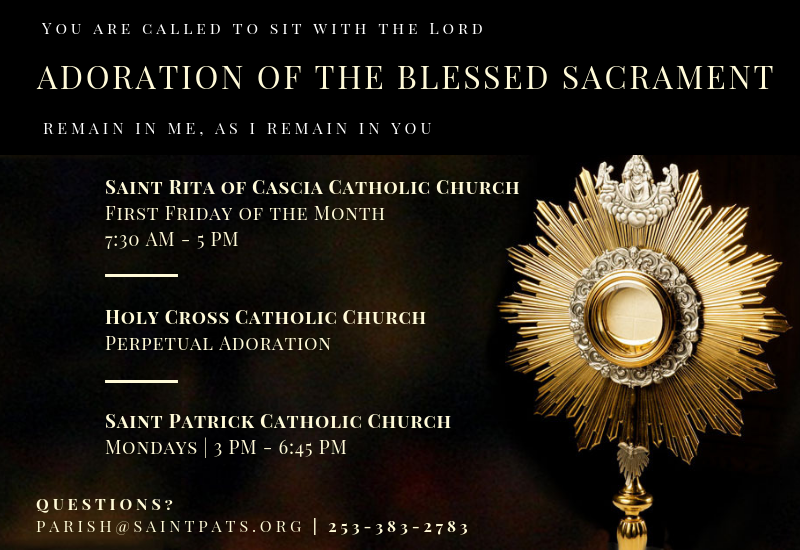 Adoration is also affered on Mondays, except holidays, 3:00 P.M. – 6:45 P.M. in the Chapel at the Parish Center at Saint Patrick Catholic Church, accessed using the J Street entrance and at Saint Rita of Cascia Catholic Church on the First Friday of each month, 7:30 A.M – 5:00 P.M. All are welcome, anytime during the appointed hours. As adults, we are called to be role models for our children, but sometimes the tables are turned, and we learn from their example. Please enjoy what our principal, faculty and Father John Fuchs, S.J. learned from sharing Adoration of the Blessed Sacrament with our students on March 1, 2018. I greeted our first graders on their return from our annual Adoration of the Blessed Sacrament this past Thursday. I asked how Adoration went for them. I was surprised when the third child in line looked me in the eye and said, “It was too short.” A student right behind her said, “I wished it was longer, too.” I glanced at Mrs. Johnson with a “who are these kids? !” look. By the time I arrived at church for the Middle School Adoration, I was eager to experience what had moved the first graders to respond as they had. The choir greeted me at the door, chanting softly, “Ubi Caritas,” a Taize prayer. The church was full but silent except for the music that settled into my mind and quieted my breathing. “Ubi Caritas et amor. Ubi Caritas est vera.” Where charity and love are. Where charity is true. I listened with a feeling of peace to a passage in the Gospel of John where Jesus declared, “This is My commandment: that you love one another, just as I have loved you.” I have listened to this Gospel many times over my lifetime, but I heard it just a bit differently, more personally, after 10 minutes of silent adoration. It was 10 minutes of quiet with Middle School kids, which, as you know, can be a challenge for them, but surprisingly, it felt way too short to all of us. After our last prayer, the Anima Christi, I stopped to thank Fr. Fuchs for leading our prayer. He said, “I thought the amount of time that we asked them to be silent was going to be too long. The kids were great.” I remembered the look I gave to Mrs. Johnson just an hour earlier. Who are these kids? They’re our kids. There are many way to sit with the Lord. Most importantly come. Come as you are, to spend quiet time with Jesus. You will find what feels right for you. Recite prayers. There are many prayers for Eucharist Adoration. Consider the one below. Are you called to sit with the Lord? Yes, I want to sit with the Lord!